Roger Debates, Matt Story, and David Mays met at my house on Friday evening for our next section of the Missouri River. Our plan was to go from the highway 212 bridge to the Oahe Dam over two days. On Saturday morning, we met a friend of mine from the running club, Art Smith, at the west shore boat ramp. He rode up to highway 212 with us and drove Roger's truck and trailer back to west shore. This way we didn't have to shuttle ourselves after two long days on the water. The day started out great. The water was glass early on and as the day progressed it got a little choppy, but nothing for us to worry about. I think we only took three short breaks during the day. 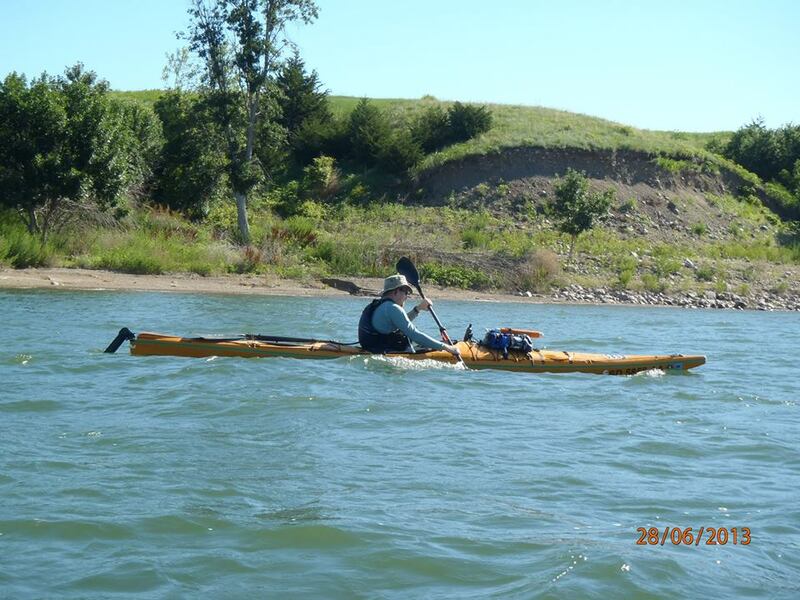 We had two large crossings to shave distance on Oahe and one smaller crossing across a bay on the west shoreline. As we came around the end of the little bend peninsula, we were met with fierce headwinds and 4-5 foot waves. Our progress was severely impeded; our speed at times dropped below 1 mph. We had been averaging around 4 mph for our moving average earlier. As the sun was getting close to setting, we started to get nervous about our progress. We ducked into a small bay to try to get our bearings and even considered camping there. Matt even had to do a roll when the waves knocked him over there. But, we pushed on, hoping to camp near a road. We did not make it to the little bend campground, but did get to the boat ramp. Which turned out to have better wind protection anyway. We camped in a small grove of trees and were feeling pretty good by the time we had dry clothes on and had some hot food in us. Freeze dried meals never tasted so good. We decided to wait until morning to see if we should continue on or bail on the 30 miles to the dam. By Sunday morning, the wind had not died down. So, I texted few friends in Pierre looking for a ride to retrieve Roger's truck. Luckily, Jesse Roebuck responded positively. While we waited for him, we made up some freeze dried eggs and bacon, added some spam to it, and wrapped the mixture in tortillas. Delicious! The wind did die down some by mid day, but that would not have given us enough time to cover 30 miles. So, we will have to cover it on our next trip before moving north on Oahe. We decided that had the SD Kayak Challenge held a race up here (this was the original idea for a route), the drop rate would have been astronomical. Rec. boats would not have fared well in the waves we faced. I also got to experiment with my new spot gen3 device/unit. It worked great. Here are the points it recorded in tracking mode (every 10 minutes). Back on July 19, I took part in the newest ultra distance kayak race on the Missouri River in South Dakota, Fort To Field 50 Paddle Battler. 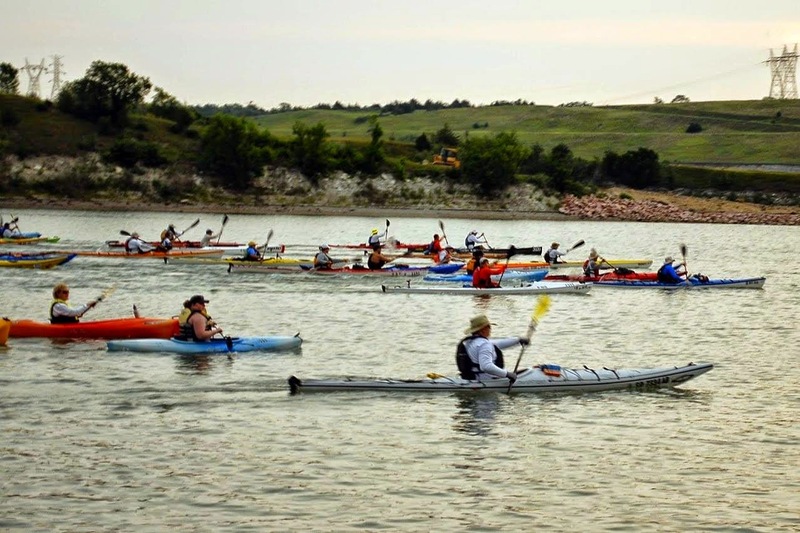 Jarett Bies, co-founder of the SD Kayak Challenge and founder of the Yankton Riverboat Days Kayak Run created it as a race to show off the river between the Fort Randall Dam and Springfield, SD. Racers assembled at the Randall Creek Recreation Area on Friday afternoon to drop off boats and other gear before heading down to the Springfield Recreation Area to drop off vehicles and catch the shuttle back. We had racers from all over, South Dakota to Netherlands! 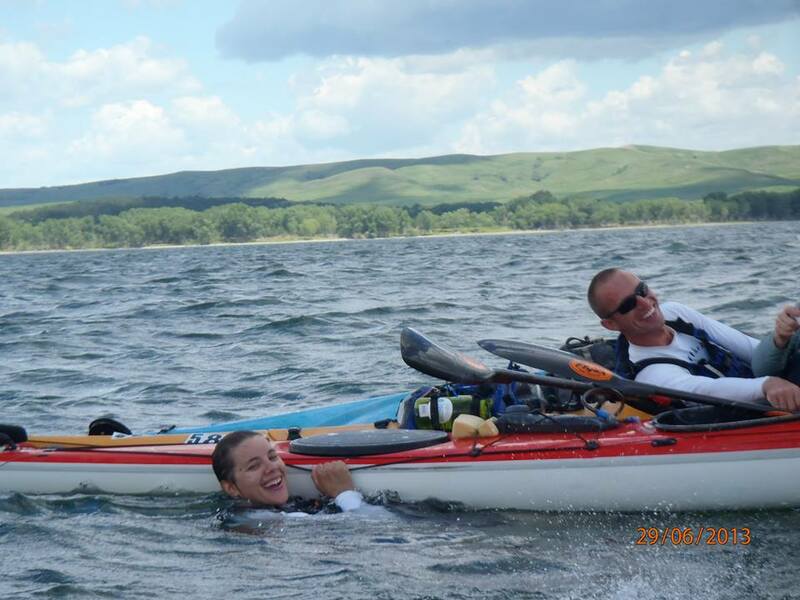 Recreation paddlers and seasoned veteran racers like Joe Zellner. Boats ranged from 8' to 20'+. Racers and support crew either camped or stayed in motels in Pickstown. The Wagner Chamber of Commerce provided our supper on Friday night, burgers, brats, and what not. The race went fine for me. I did not get out of the boat at all and kept JB Halter in sight past CP1 which is about 18 miles from the start. As I passed the third and last check point at Running Water, I heard that only 6 paddlers were a head of me. But, when I reached the finish in Springfield, I was asked if I saw Zach Wipf. Apparently, he got mixed up and missed the chute to Springfield. He must have paddled along the Nebraska shore all the way to Lake Lewis and Clark. He had been in 2nd place all day, but finished in the 20s. It shows the importance of studying the river in this area. So, I managed to finish 6th overall, 7 hours and 29 minutes. The remainder of the afternoon and evening were spent helping racers out, enjoying a delicous post race meal and refreshments provided to us, and BSing about the race and racing in general. Overall winner, Joe Zellner was great for sharing advice and tips. A group of us then went to get a second supper at a local bar and grill before heading to our campsite for the night. Overall, it was a great race that I will try to fit into my schedule every year. As has been apparent this year, I am a bit burnt out on blogging. I have three trips worth posting that I have not been motivated to post anything about. 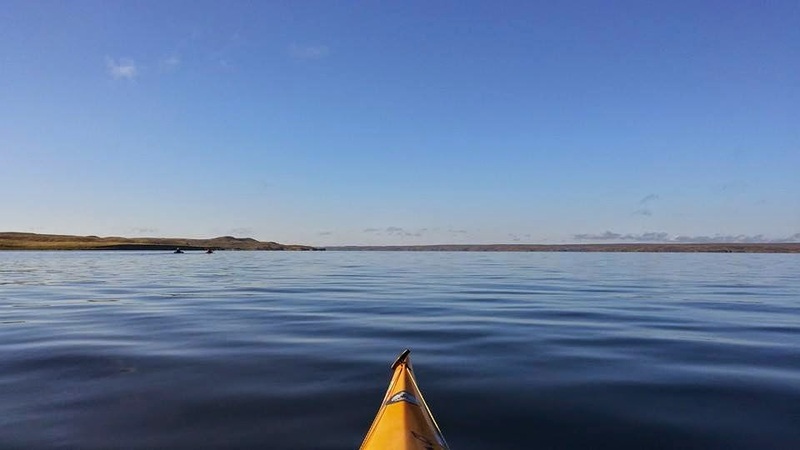 A SDKC training paddle from the start to CP 3 in early May. The inaugural Fort To Field 50 Paddle Battle. Whether or I ever put a post up for any of these is yet to be seen, but I just extended an invitation to fellow Pierre paddler, Matt Hicks to join the blog as an author. Others may be welcome too as time moves along. 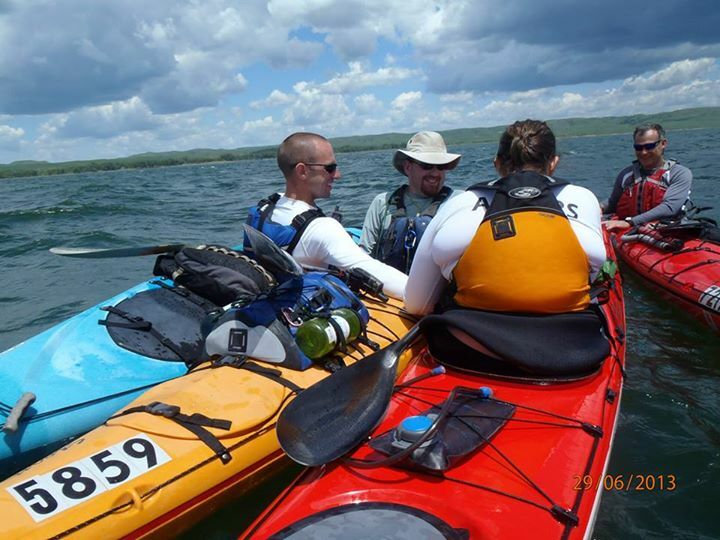 This past weekend Roger Debates, Matt Story, and I set out to complete the last 70 mile of the Missouri River between the Oahe Dam and Sioux City that we have not covered yet. We would be joined by David Mays and Rebecca Cruse with logistical support from Steven Joseph. The course would be from the Ft Randall Dam to the Gavin's Point Dam. We met at Steven Joseph's house in Utica, SD on Friday night and camped in his yard. On Saturday morning, we began our shuttle which included dropping my pickup and my kayak off in Springfield. Rebecca needed to be back in Pierre by Sunday afternoon, so the plan was for her and I to paddle a tandem kayak borrowed from Katie Engle on Saturday and on Sunday morning we would swap boats at the Springfield boat ramp and Rebecca would return to Utica, SD with my pickup to retrieve her car. Once at the Ft Randall Dam boat ramp, we unloaded our boats and began loading the remaining gear into them. Steven road along with us and would return to Utica with Matt's truck with Roger's trailer. The river flow is quick below Ft Randall. It is a section of the MNRR; extending to Running Water, SD. We were maintaining 6-7 mph early in the trip. We took three breaks throughout the day, at sandbars near Sunshine Bottoms and Verdel and at the Running Water boat ramp. During the second break, it was very warm out and our motivation was low. So, we took a little break to cool off in the river. It felt great and seemed to re-energize everyone. We reached our planned campsite, a sandbar just upstream of Springfield by sunset. We covered about 44 miles on Saturday. Bugs were bad, so after preparing and eating our suppers we didn't stay up too long before calling it a night. During the night we got hit by a T-storm. Since we set out tents up on a sandbar, the stakes were just about useless. We were the only things holding our tents down. Thankfully, we weathered the storm just fine, as did the boats. After a quick breakfast in the morning, we loaded our gear back into the kayaks and headed for Springfield. Once we had the overnight gear and the tandem loaded into my pickup (and my boat unloaded), we headed back out towards Gavin's Point and Rebecca took my pickup back to Utica to retrieve her car. We covered 3.5 miles to Springfield on Sunday morning. As expected, we lost the current as we made our way into Lewis and Clark Lake. We also gained a slight tailwind. The benefits of the tailwind were short lived though. As we progressed, the recreational motorboat traffic began to increase. The tailwind wasn't even a thought while we fought through boat wake coming from every direction. I believe we took two breaks on L & C Lake, one was just downstream of the Lewis and Clark Boy Scout Camp and the other was on a rocky beach about 5 miles from the dam. Steven met us at the marina boat ramp at the face of the dam and we loaded up to head back to Utica. We straightened gear out and showered before heading into Yankton to reward ourselves with supper at JoDean's (a large buffet). We covered about 21 miles from Springfield to the Gavin's Point Dam and totaled about 68.5 miles over the weekend. 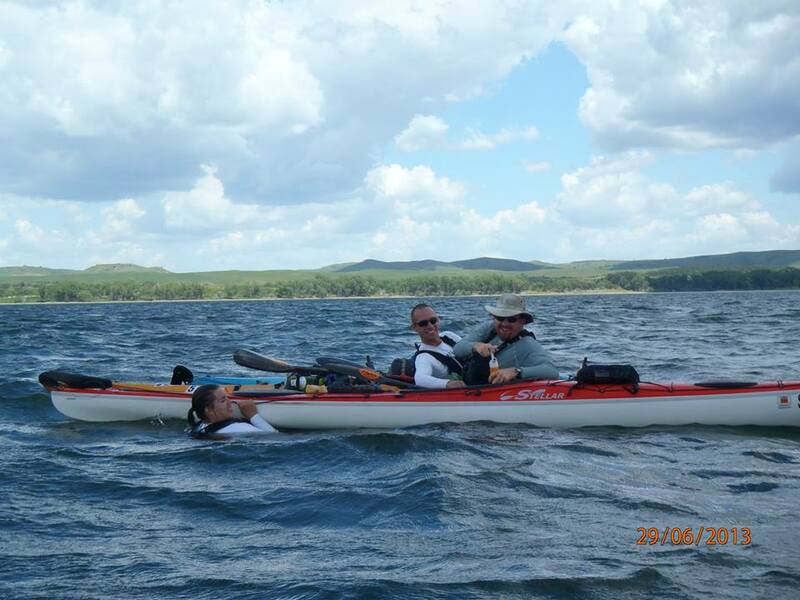 Last week I participated in the MR340, the longest non-stop canoe and kayak race in the world, with a few friends. Team SoDak was made up of Steven Dahlmeier and Cecil Caulkins running support crew for Kati Albers, David Mays, and me and Donna Savage running support crew for Doc Savage. The race began at 7 AM on Tuesday to the firing of muskets and a cannon; 8 AM for the tandem and team boats. When I paddled into Miami on Tuesday night, I decided to take a 30 minute break and eat some real food, fried chicken. I was already finding out that the food sold at the checkpoints sounded better than the tortillas and peanut butter I had brought. I pushed on from Miami with a couple of local paddlers and Dave and Kati tried to get some sleep at Miami. Part way to Glasgow, I was struggling to keep up, so around 4:30 AM (Wednesday) I pulled off at the Dalton access for some sleep. I covered 128 miles on the first day. Doc pushed all the way to Glasgow on the first day. The local paddlers were Charles and Bob; they will come up again. I left Dalton around 6:30 AM. When I arrived at Glasgow, Charles and Bob's boats were there. I waited for Steven to arrive so I could resupply then I was off for Katfish Katy's. At Katfish Katy's, I had an awesome bbq pork sandwich and coleslaw. Delicious. From there it was on to Jeff City. I ended up paddling with Charles and Bob again when night came too. This is also when lack of sleep hit me. My depth perception was gone. I kept thinking the trees on shore were in the river until I saw a boat go through them. We arrived at Jeff City at midnight. I think Charles and Bob pushed on to camp on a sandbar between Jeff City and Herrman. 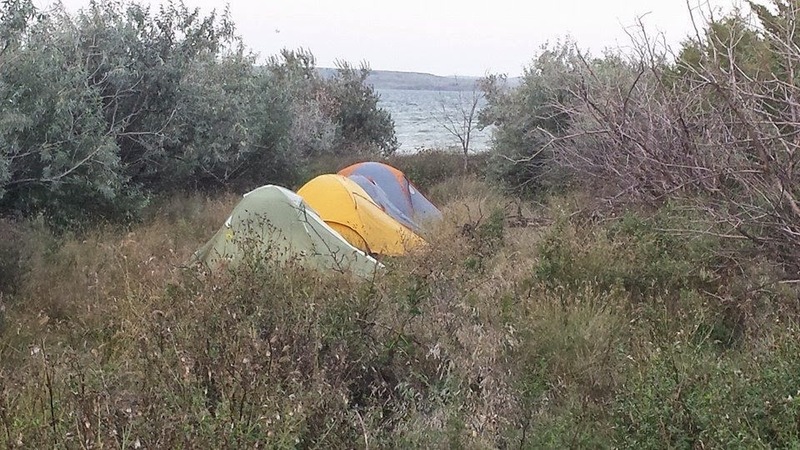 I later found out that David's tent was near me too. Kati slept at Katfish Katy's. Doc, I think, pushed to Herrman on day 2. I covered 95 miles on day 2. I had planned to get on the water by 5 AM, but I didn't wake up until then. Instead, I departed around 6:30 AM which was fine. A paddler I quickly caught up to said that her brother, further ahead, had texted that the fog was bad at 5 AM. I ate more real food at Hermann and kept pushing. At Klondike, I had Cecil pour some Coke into an empty Gatorade bottle, so I had a source of caffeine on me. The first half of the final stretch went fine. I had some trouble navigating a couple of times. There was a wing dike that I got stuck behind that seemed to stretch halfway across the river. After that, a few other paddlers showed up and I finished with them before 4 AM on Friday. My time was 68:48. My last day was 115 miles. And, somehow, I finished before Charles and Bob. By the end of the race, my hands were blistered up pretty good. My feet were sore from wearing the five fingers all week and ruddering. My side was sore from my paddling rotation. And, my back had a large rash from my wet shirts riding up on me. It was the single toughest event of my life, but totally worth enduring. What I would do differently: use gurney goo to prevent blisters, petroleum jelly to prevent chafing, carry a spotlight. My 100 lumens headlamp was not as adequate as I could of hoped. It worked, but something with more range would be better. I would push all the way to Glasgow on day 1 and Hermann on day 2. Also, spend less time at checkpoints. I should also note we had near perfect weather for the race. Highs in the 80s and lows in the lower 60s or upper 50s. Also, a little wind (headwind though) and no storms. A little rain for Dave and Kati at the finish. This past weekend, Katie Albers, David Mays, Roger Debates, Matt Story, and I finished off Lake Francis Case, paddling 31 miles from Platte Creek Recreation Area to North Point Recreation Area (adjacent to the Fort Randall Dam). Wind was out of the north at 21 mph with gusts up to 26 mph. We had 2 to 3 foot waves at times, including during a couple of open water crossings to shave distance when the wind was a side wind. Only one swimmer on the day. We did a great job working together to get Kati back into her boat in the middle of the river amongst the waves. It was also a great weekend for camping. Roger Debates and I used our hammocks instead of setting up our tents. Kati and Matt. Picture courtesy of Roger Debates. Kati, Matt, and me. Picture courtesy of Roger Debates. Matt, me, Kati, and David. Picture courtesy of Roger Debates. I took Team Nautical But Nice on a 20+ mile training cruise on May 12. We started off with breakfast at Oahe Marina, then began the cruise. We kayaked down to Antelope Creek, then back up to the Farm Island boat ramp in Hipple Lake. We covered 22.4 miles.